Many people remember their family vacations by looking over the snapshots they take. Oddly enough, I am not one of them. I think it has something to do with being a perfectionist when it comes to photography. It makes it difficult to just knock off snapshots. Oh sure, I do have a tiny point 'n shoot and certainly take some quick shots of the kids on the beach and that sort of thing. But I don't particularly enjoy doing that because I constantly find myself trying to figure out how to make the shot better instead of enjoying the moment. Or, if I see something really nice, I will find myself wishing I had my dSLR along. I know this isn't a good habit to have, but it just is.....so instead of taking a ton of snaps I live and experience the vacation with joy but without trying to fully record it. My wife ends up taking snaps that we can enjoy years down the line. What looking through images does for me is to remind me of the workshops and photography trips I have been on. I have many images from these trips and they are associated with memories of working hard with a group of like-minded people to try and make good photographs. 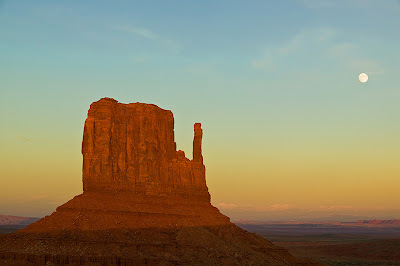 I was recently going through some shots and ran across this one, which reminded me of a terrific evening on a workshop with Alain Briot at Monument Valley. Visiting Antelope Canyon, which is located on land belonging to the Navajo Nation within Arizona, USA, is a deeply personal experience, even if you must work your way around the crowd. It is very easy to see why the Native Americans considered this a sacred location. About two years ago I attended a workshop at the canyon, which was given by Alain Briot and Uwe and Bettina Steinmueller. The shapes and twists of the canyon walls are amazing. 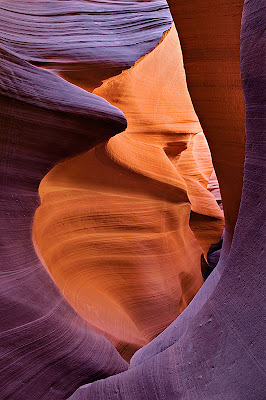 The colors are surreal, which leads to some problematic issues when portraying the canyon photographically. First, it would be useful to offer a brief explanation of how the colors arise. The walls of the canyon are made of sandstone. When the sun is high in the sky, one of the two canyon walls are illuminated by direct sunlight. Because of the composition of the sandstone, the wall shines brightly and reflects red light onto the opposing wall, causing it to appear an unbelievable fiery red/orange. The reflected light is very intense on the opposing wall because the canyon itself is very narrow; in many areas a person can touch both sides of the canyon with outstretched arms. However, this same proximity of the two walls causes the reflected light to be fairly focal so that only localized areas take on this fiery appearance. What color, then, is the part of the wall not receiving reflected light? That is where the difficult issue starts. There are areas of the walls that are illuminated not by the sun nor by reflected light, but by the blue sky overhead. This blue light in conjunction with the sandstone produces an odd blue/purple color, and this is where our brains start to get in the way. As most people undoubtedly know, the brain and optic system has an uncanny way of neutralizing color casts. That is why we don’t ‘see’ a blue cast in the shade or a green cast on the white dress of a little girl romping in a field of green…..but that cast does appear in our photographs. Is the cast as seen in the photograph real? Sure. If we have the option, do we take it out in Photoshop? Unless looking for an unusual effect, I think most people would. Though the color cast is ‘real’, it is not something we normally see and because we ‘know,’ or think we know, what a girl running in a field or in the shade looks like, the cast becomes something we want to eliminate. However, at times, such as sunset, we welcome the color cast because it seems to enhance what we ‘want’ to see even though our brains don’t really view the surrounding landscape as glowing orange. Back to the canyon. Our brains tend to neutralize the bizarre blue/purple cast on the walls that are illuminated by the sky and we, or at least I (that raises another issue of individualized color perception…but let’s put that off until another time), see the color as a bluish grey, not unlike the flagstone used in garden walkways. The instructors showed prints that had the shaded rocks portrayed as a deep blue/purple. After some discussion, I learned that what I had initially thought was marked manipulation was, in fact, an accurate portrayal of the way this rock appeared when taken with slide film such as Velvia, and that if one used a colorimeter to actually ‘measure’ the color it would fall into a wavelength that would appear similar to the slide . The final print matched the slide’s reality, which came close to what an objective measurement of color indicated was real. 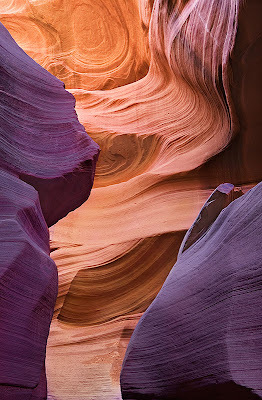 So what should a print of Antelope Canyon look like? What our eyes see? What the colorimeter says is fact? What slide film suggests is reality and, if so, what type of film…high or low contrast, high or low saturation? Is adjusting the color of a digital image captured in RAW format to match what is real less valid than what our eyes perceive? I am not talking about ‘Real vs. Feel’ (see my post here ) but am speaking of perception vs. reality. These images are my interpretation. There are certainly other different, yet equally valid, portrayals possible. Reality can be a thorny issue.